A Billroth II (Fig. 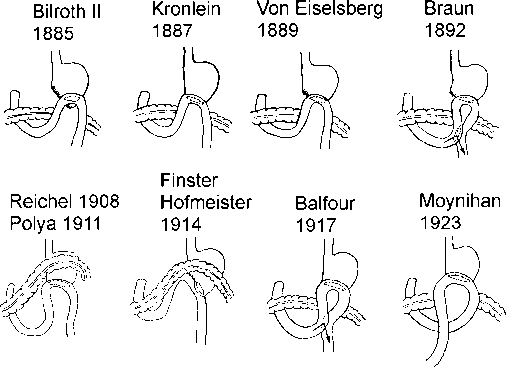 4) is a loop gastrojejunostomy and was first performed by Billroth for a large pyloric cancer. After distal gastrectomy, the proximal stomach is anastomosed to a jejunal loop, performing a gastrojejunostomy. It is important to remove the entire antrum, because any retained antrum secretes gastrin and is a potent cause of ulcer recurrence. The jejunal loop can be brought up either anterior to the transverse colon (antecolic), or through the transverse mesocolon (retrocolic) for the gastrojejunostomy. The afferent limb is usually sutured to the greater curvature and should lie comfortably without tension or kinking. In performing gastrectomy for benign disease, there is no clear evidence that either an antecolic or retrocolic gastrojejunostomy provides better emptying. For malignant disease, many surgeons feel that the retrocolic position may predispose to obstruction from enlargement of lymph nodes or serosal implants in the mesocolon. The afferent limb should be as short as possible without putting tension on the anastamosis. This will help avoid the afferent loop syndrome. 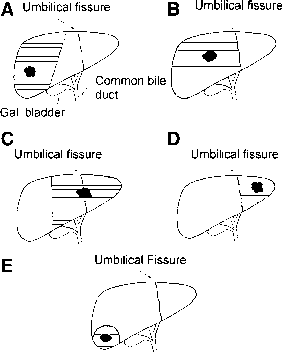 There are many modifications of the Billroth II gastrojejunostomy (Fig. 5). Fig. 5. Billroth II with some of its modifications and the year it was described.